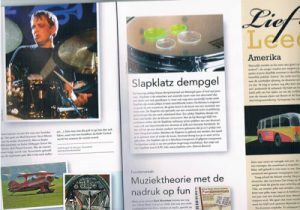 Polish online drum magazine BeatIt, has reviewed both SlapKlatz and SlapKlatz PRO on their website. BeatIt also made a demo video, demonstrating the different SlapKlatz gel sizes and configurations, all applied to the same snare drum. This is the first review to show all six versions of SlapKlatz. The US drum blog Drummers Basics has posted a very thorough review of SlapKlatz PRO, comparing them with other different drum damper brands – such as MoonGel, DrumDots and so on – and has come up with a lot of conclusions. See why the reviewer decided to go with SlapKlatz PRO. 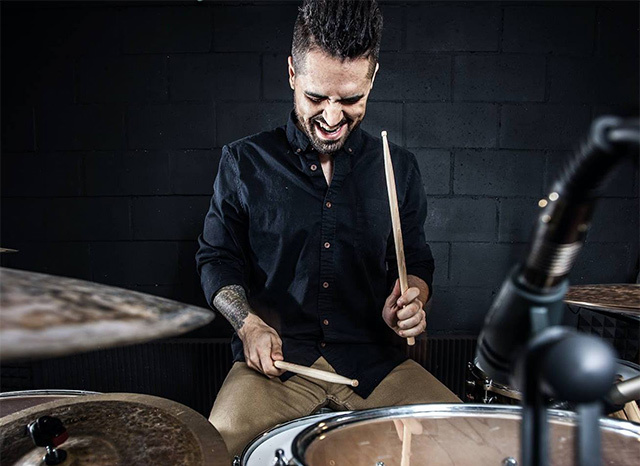 US drummer and You-tuber TJ Hartmann, recently took SlapKlatz for a testdrive on his channel. Luckily, he liked the product. TJ emphasized how well the gels work on the bottom heads – something that has caused him trouble with other brands of damper gels. Also, TJ has recorded some sound samples so that you can hear some before/after comparisons. You can find the review from TJ Hartmann here. 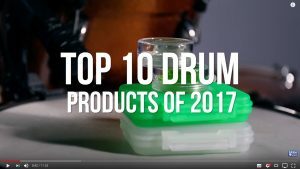 Gabe over at Drum Beats Online has made a run down of his Top 10 favorite drum accessories under $20 for 2017. And we are proud to announce, that both SlapKlatz and SlapKlatz PRO has made it into his list. In this video you can also hear Gabe demo the product, as he plays his snare drum with and without SlapKlatz on it. More and more customers has left their SlapKlatz reviews on Amazon. These reviews are great, since they are written by customers for customers, so you know they are 100% honest. 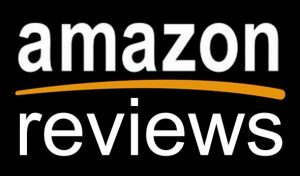 You may want to check out these links every now and then, since more reviews are written all the time. You can find all the SlapKlatz PRO clear reviews here. You can find all the SlapKlatz PRO alien green reviews here. “The product is incredible! I’ve used just about every dampening products on the market. Drum Dots, Drum Tacs, MoonGel, Evans Min-EMAD… just to name a few. Of all these products, Slapklatz is truly my favorite! The gels sticks perfectly to the drums, and the range of sizes is genius! 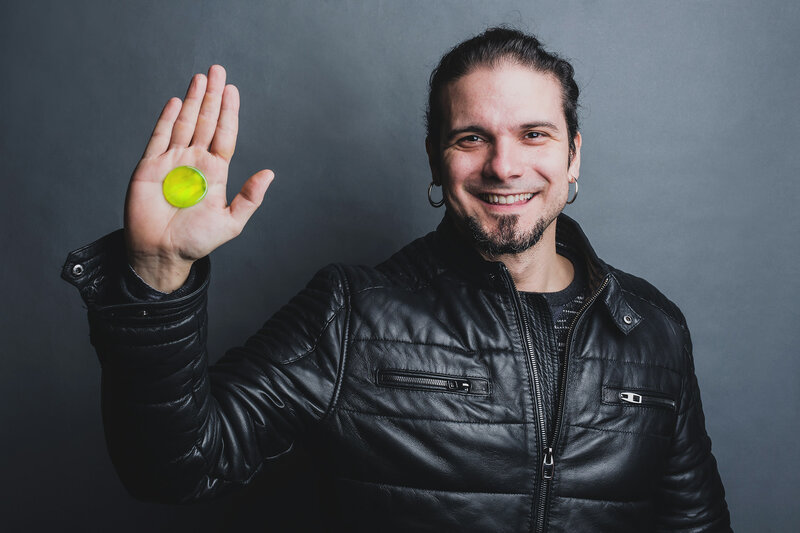 Don’t forget to check out Adams website – click here! You may know Austin Burcham from his amazing Study The Greats videos. If not, check them out (here is a link). Austin recently did a very thorough review of SlapKlatz Pro, including sound samples, comparisons and much more. 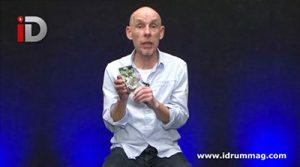 In this review you get to hear the differences between small, medium and large sized gels, as well as the difference between using 1, 2, 3 or 4 small gels on your snaredrum. Until recent years, the dampening market has been more or less dominated by one product. Since our gaffer tape was cast aside in favour of those little blue rectangles, drummers have been able to work more quickly in achieving a desired sound with minimal fuss and minimal mess. Relatively new arrival to the market SlapKlatz now brings us the new ‘Pro’ package. The package includes 10 circular gel pieces: six small (2cm), two medium (3cm) and two large (4cm); all contained within a rectangular hard plastic carry case. They are available in a clear version and SlapKlatz’s original luminous ‘Alien Green’. Starting with one of the smaller 2cm discs placed near the rim of a 14″ snare drum, the sonic difference is noticeable but pleasantly subtle. This allows the effect to be applied incrementally by adding one more at a time. The feel of the drum is barely changed at all as more gels are added, and nor does the head become choked out despite the tight tuning. 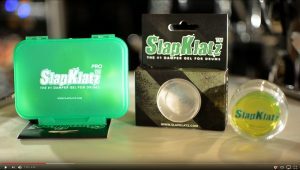 Although the Pro pack comes with much larger gels, SlapKlatz recommend that the smaller ones are used, placed in opposing positions on the drum’s surface. That said, I took a shine to using one of the largest 4cm pads on a 16″ floor tom and found the result to be a satisfying controlled boom. Due to the more subtle nature of the SlapKlatz gels, cymbals benefit well from the same treatment. The gels are so sticky that you can even hide them away on the underside of the cymbal for a more subtle appearance. One or two of the smaller pads will ease some of the ring from a ride cymbal or dry up a pair of hihats quite nicely. Avoid the larger ones though, unless you’re looking for more of a really dry, borderline electronic cymbal sound. FOR: Does exactly what it says on the box…and does it well! 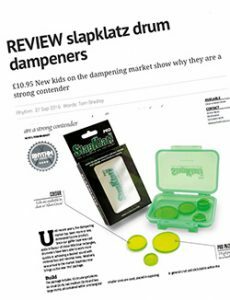 SlapKlatz Pro was reviewed by UK drum magazine “Drummer” in May 2016, under the title “The good kind of tacky”. 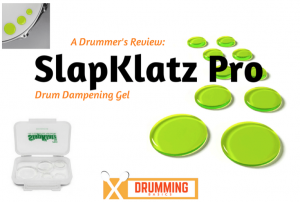 “If you’re a drummer who feels the need to dampen your drums without dampening your enthusiasm for drumming, it may be worth you considering SlapKlatz Pro damper gel. The market for dampening agents is now well established, replacing the rolled up tissue and gaffa tape method, which is sticky, cumbersome and full of residue. There’s nothing wrong with this old method, but these days it’s good to have a product that’s portable, accessible and doesn’t leave goo all over your precious tubs and discs. 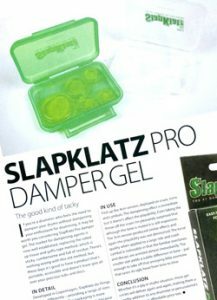 Developed in Copenhagen, Slapklatz do things slightly differently – providing a range of sizes of dampening gels. The packag ing is more substantial than current other brands because you get more to work with . Available in two colours, clear or vivid luminescent green, you are not going to lose these in a hurry as they positively glow. As with most products of this nature they do attract dust and fluff over time and handling, although it’s not a problem as they can be cleaned in soapy water. 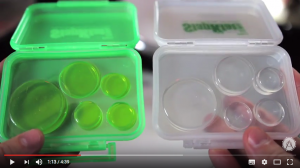 Each container gives you three sizes: 4cm and 3cm circles of gel (two of each size) and 2cm circles. First up the 4cm version, deployed on snare, toms and cymbals. The ampening effect is immediate but it doesn’t affect the playability. Even taking the throw off the snare I’m pleasantly surprised that although the tone is muted it is still responsive. The 3cm version produced similar effects and again the playability was not diminished. The tonal quality when applied to a large ride and crash cymbal is noticeable in that the familiar overtones and decays are arrested almost immediately. The smaller size yields a subtle difference in tone – just enough to take off that annoying little overtone that raises its ugly head from time to time. 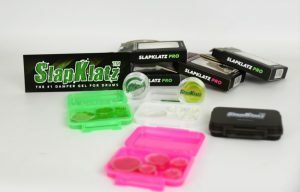 “SlapKlatz offer two conveniently sized gel pads, available in clear or Alien green, that come in a protective container that will assist in keeping the gel pads clean and safe. Each container comprises two large and two small gel pads that make for quick and easy application depending upon the size of the drum or the level of damping that you require. As you can mix and match either sized pad, your options for damping are (no pun intended) wide open. The SlapKlatz gel dampers offer a super sticky surface that will adhere firmly to coated or clear heads (resonant and/or batter side) and you could even use one or more to suppress cymbal overtones should you need to mute excess ring or bring any high-end frequencies under control. The screw-top container will fit easily into a stick bag, ensuring that you always have the pads to hand. Should the pads become dirty, then simply wash them under warm water with a little soap and they will return to their initial sticky level and look as bright as buttons. You can read the free issue of the magazine here, as well as watch the filmed review here. “The sticky blue gel slices from Moongel has been out there for quite some years now. SlapKlatz is perhaps a strange name for an alternative that is not only cheaper, but also sticks considerably better. SlapKlatz are round slices in two different sizes. The smallest is about the size of an euro coin, the big one comes close to a €2 coin. Slapklatz are made from a very soft and sticky gel that does its job extremely well. The SlapKlatz gel pads dampens slightly more than the blue competitor. Just like Moongel, the problem is that Slapklatz sticks not only to a drumhead, but also to a drum bag or even a sweaty towel are possible targets, making it difficult on a dark stage to find your gel pad. Should your SlapKlatz pads become dirty after use, then just rinse them under running water. Once dry you can use them just fine.